Aluminum Die Casting Motor Side Housing, the material of this part is ADC-12, the part is a housing for DC motor on windscreen wiper system which is used on bus, boat after assembly, the part is an end cover, work with a mating pivot housing, the DC motor run in these two housing. On this part, there are a lot of teeth. the clearance of the teeth is small, what's more, the permissible draft of the teeth is only 1 degree, there will be potential risk for failure of mold release. The material of this part is ADC-12, it a Japanese aluminum type. The material should conform to standard of JIS H 5302-2000, a very common material in high pressure Die Casting. The material is equivalent to Chinese aluminum alloy YL113, the corresponding standard is GB/T 15115-2009. And the material is also equal to A383, the criterion is ASTM B85-03 Standard Specification for Aluminum-Alloy Die Castings. The part has request on surface finish of E-Coating to satisfy the daily application, so to test the density of the part is very important. , in engineering's work instruction, the operator should fracture the part and look into the section of the fracture to see if the particles is good and dense prior to production, ensure there is no big single porosity or a lot of continuous small porosity, or while e-coating, during process of curing in over under 170-200 degree temperature, the porosity existing internal will expand to get out, leading to big cosmetic issues on this part, such as bubble, pits etc. For this part, after die casting, the workshop will remove the gate by manual. Then flow to polishing process, polishing to remove the vestige of the gate. Looking for ideal Pivot Housing of Motor Side Manufacturer & supplier ? We have a wide selection at great prices to help you get creative. All the Aluminum Alloy Pivot Housing are quality guaranteed. 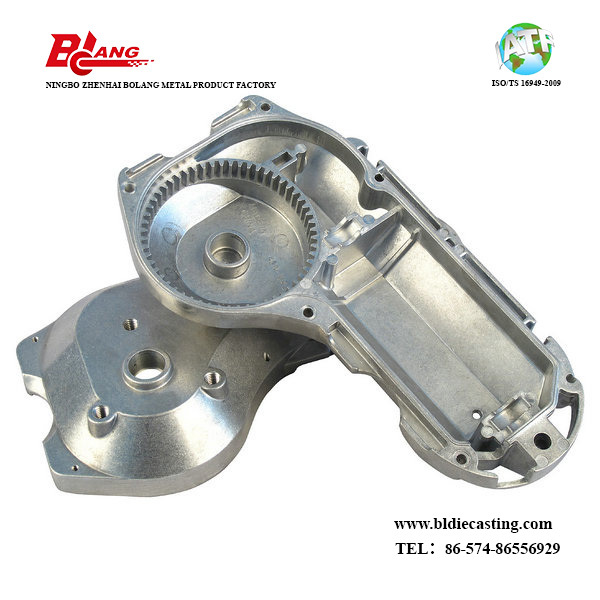 We are China Origin Factory of High Pressure Die Casting Motor Housing. If you have any question, please feel free to contact us.